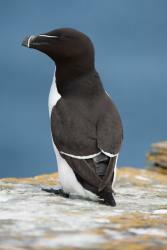 Razorbill with tag. : Image Derren Fox/ RSPBWhen the UK's Royal Society for the Protection of Birds (RSPB) set out to tag razorbills, their aim was to track their behaviour and movements along the coast of North Wales. The tag data revealed that, at night, these seabirds spent a lot of their time idle on the sea surface. "We saw this as an opportunity to re-use the data and test if the birds might be drifting with the tidal current," says Matt Cooper, a Master of Oceanography graduate from Bangor University in Wales. It turns out they were, according to a new study led by Cooper that shows the potential of using seabirds to measure ocean currents. The results are published today in the European Geosciences Union journal Ocean Science. Cooper’s supervisors at the School of Ocean Sciences knew of his interest in tidal energy and data collection, so they suggested he look into seabird data collected by the RSPB to see whether it would be possible to extract tidal information from it. 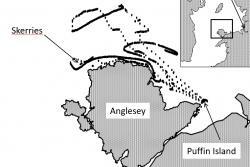 A few years earlier, from 2011 to 2014, a RSPB team had fitted GPS tags on razorbills on Puffin Island, North Wales, to study their distribution and breeding and feeding behaviours. These black and white seabirds, similar to puffins and guillemots, only come to coastal lands to breed. They spend most of their time at sea, foraging or resting on the ocean surface. The data collected when the birds were sitting on the sea surface for hours on end were interesting in terms of bird behaviour, but the Bangor University researchers saw another potential use. “We took data that was discarded from the original study and applied it to test a hypothesis in a different area of research,” says Cooper. “As far as we are aware, this paper is the first to describe the use of tagged seabirds for measuring currents of any kind,” the researchers write in their Ocean Science study. Map showing recorded movements of tagged razorbills.The non-invasive GPS tags on the razorbills recorded their position every 100 seconds. With a set of positions and a known time between each of them, the scientists could calculate the speed and direction of the birds’ movements. When the sun set and the sky was dark, the birds spent long periods at rest on the sea surface, drifting passively with the current. “[At these times] their changing position would reflect the movement of water at the ocean’s surface,” Cooper explains. With speeds of more than 1 metre per second, the average tidal currents in the area of the Irish Sea the researchers focused on are very fast, faster than a razorbill can paddle, but much slower than the speeds the birds reach when flying. This means the team could filter out the times when the birds were flying. In addition, the filtered data showed that, when the birds were drifting, the direction of movement changed when the currents in the area were expected to change from ebb to flow and vice-versa, at the times of low and high tide. Therefore, the team could be sure that they were tracking the speed and direction of sea currents rather than the birds’ independent movements. Using seabirds to measure tidal currents has limitations. “We must remember that these birds are behaving naturally and we cannot determine where they go,” says Cooper. But the Ocean Science study shows there is potential for this inexpensive method to provide crucial tidal information over a wide area. By studying other tagged seabirds, we could learn more about our oceans, especially in more remote regions where it is challenging to collect oceanographic data.